Digital Distress: What is it and who does it affect? Part 1. As the digital economy and society continue to grow, communities and individuals have a shot at improving their quality of life. However, not everybody is being able to participate in this digital age. Those on the wrong side of the divide are being left behind, prompting the creation of strategies to ensure everybody can reap the benefits of this new age. Digital inclusion is one such strategy. The Office of the Comptroller of the Currency (OCC), when talking about bank financing for broadband initiatives in a recently released report, defined digital inclusion as “the adoption of broadband technologies and its meaningful use for social and economic benefits”. Being able to identify areas in dire need of digital inclusion efforts is an important step to take to ensure everybody participates and benefits of the digital age. Multiple analyses exist that focus primarily on access to broadband of at least 25 Megabits per second download and 3 Megabits per second upload, or 25/3 for short, current broadband definition per the Federal Communications Commission. While useful to jump start conversations, these analyses miss an entire dimension of digital inclusion: how the technology is leveraged, or not. Now — thanks to data from the U.S. Census Bureau American Community Survey (ACS) — a look at this dimension of digital inclusion is explored through looking at two broad indicators: type of internet subscription (or lack of) and device ownership (or lack of). Just like economic distress measures exist — typically looking at unemployment and income levels — this article proposes a new metric called digital distress. Digital distress areas have a harder time using and leveraging the internet to improve their quality of life due to the type of internet subscription or devices owned. Digital distress is defined here as census tracts (neighborhoods) that had a 1) high percent of homes not subscribing to the internet or subscribing only through a cellular data plan and a 2) high percent of homes with no computing devices or relying only on mobile devices. Given that the subscription and computing device variables are not mutually exclusive, simply adding up all homes to obtain a final percentage was not possible. For this reason, variables 1 & 2 (see list above) were compiled into one percentage called subscriptions while variables 3 & 4 were compiled into one percentage called devices. 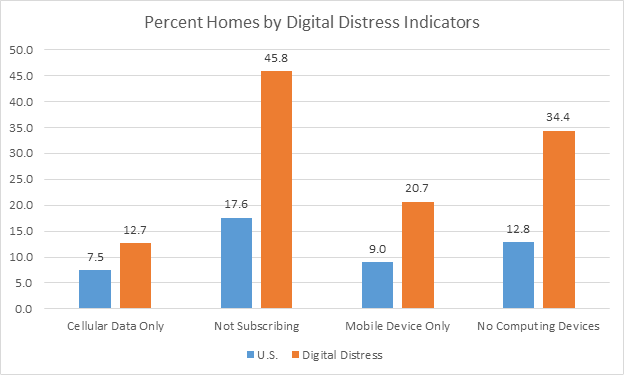 Z-scores were then calculated for both aggregated percentages (subscriptions and devices), added together, and normalized to a score from 0 to 100, where a higher number denotes a higher digital distress. Tracts were considered digitally distressed if their score was greater than 50. Figure below shows the breakdown for the U.S. and digitally distressed tracts for each of the four variables utilized. As expected, tracts in digital distress (orange bar) had a higher share of homes in each of these indicators. Almost half or 45.8 percent of homes in digitally distressed tracts did not access the internet versus 17.6 percent in the U.S. overall. Similar pattern can be seen with not owning computing devices where slightly more than one-third (34.4 percent) of homes in digitally distressed areas did not own a computing device compared to 12.8 percent in the U.S. overall. Of the 72,417 tracts analyzed, a little less than 6 percent or 4,281 were considered digitally distressed (score greater than 50) spanning 47 states and 942 counties. Map below shows where these tracts were located. Noticeable pockets exist in the deep south, southern Texas, and between New Mexico and Arizona. Note that the map resolution makes it hard to visualize these tracts in urban areas but that does not mean they are not there. completely rural tracts had more than 99 percent of their population living in rural areas. Figure below shows that, out of all U.S. Census tracts analyzed, about two-thirds or a little more than 64 percent were considered completely urban compared to 11.7 percent completely rural (blue bar). Interestingly however, of the digitally distressed tracts, more than two-thirds or 68 percent were completely urban compared to 16.9 percent of completely rural areas (orange bar). 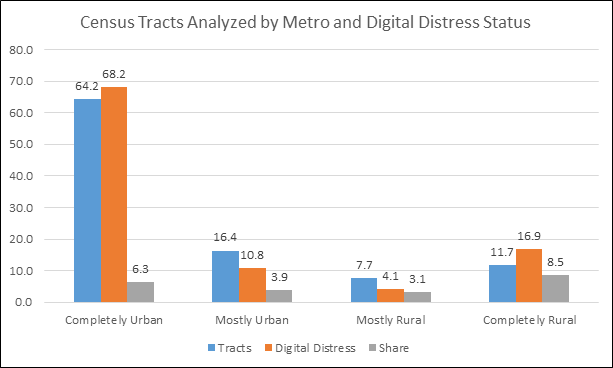 And when looking at the share of digitally distressed within metro status, 6.3 percent of completely urban tracts were digitally distressed compared to 8.5 percent of completely rural (gray bar). 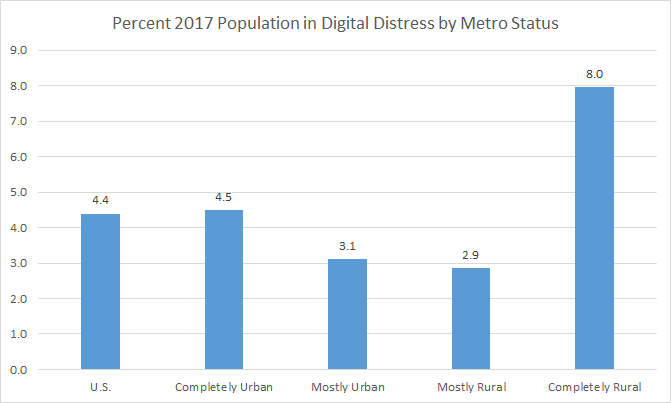 Regarding population and not census tracts, the figure below shows that 8 percent of completely rural residents were in digital distress compared to 4.5 percent in completely urban areas. Overall, 4.4 percent of the U.S. population was in digital distress. The fact that a majority of digitally distressed tracts were completely urban is interesting because previous work has shown over and over that rural areas lag urban when it comes to 25/3 access. However, in this case, the majority of tracts in digital distress were completely urban. Granted, also the majority of tracts were completely urban to begin with, but still, the high share of completely urban in digital distress was not expected. In other words, digital inclusion impacts urban and rural alike with the former in regards to internet subscription and device type and the latter in regards to 25/3 access. The next post in this digital distress series will take a look at socioeconomic characteristics of digitally distressed tracts. This article reflects our views, not those of our employers.